Styled and designed for the bold modern day man, tribal rings offer a new look that many can appreciate. It is far from your traditional styles, using creative designs like dragons, tribal waves, and much more. Our selection is full of great choices that are affordable and unique! With our men’s tribal rings, it is easy to display your confidence, or your sense of style by simply wearing one of these rings. Our choices are made from stainless steel, which is known for being durable, they come in many variations of black and silver to help you stand out in many ways. These designs have been handcrafted with immense attention to detail, as these rings offer a bold style that will fit many new fashion trends. Whether you follow trends or you’re a trendsetter, you can’t go wrong with any of our tribal rings. The designs are absolutely stunning, they fit comfortably on everyone, and there is one for every type of man here in our selection. Our options are priced affordably, and they come in a wide range of sizes to fit him appropriately. 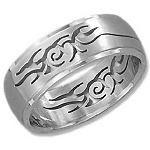 Men’s tribal rings provide a certain appeal that is simply different from anything else you’ll find. 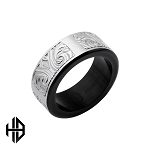 Whether you’re looking for a silver band with black engravings for an attention-grabbing look or a black band with silver tribal markings and a polished finish for a masculine appeal, we have the rings you need to make whatever type of statement you want. These can be used as a wedding band or for everyday use. When you shop with us here at JustMensRings.com, you are in control of your own style and can find the look you’ve always wanted. We would be happy to answer any questions you may have about our expansive inventory or our lifetime guarantee!